Mayor Teresa Jacobs and City of Orlando Mayor Buddy Dyer join the Edgewater High School football team and leaders from the local community, ESPN and the NFL to announce the move of the Pro Bowl to Camping World Stadium. Orange County Mayor Teresa Jacobs joined the community and leaders from Walt Disney World Resort’s ESPN Wide World of Sports and the National Football League (NFL) on June 1 to announce that Camping World Stadium will host the NFL Pro Bowl in 2017. The annual all-star game will be played on January 29, 2017 at 8p.m. EST, and televised live on ESPN and ESPN Deportes. Mayor Jacobs was also joined by City of Orlando Mayor Buddy Dyer, Florida Citrus Sports CEO Steve Hogan, nine-time Pro Bowler and ESPN analyst Charles Woodson and NFL and ESPN leadership. In conjunction with the spirit of the Pro Bowl game, the NFL will celebrate its brightest stars of today and tomorrow with new Pro Bowl Week festivities in 2017. 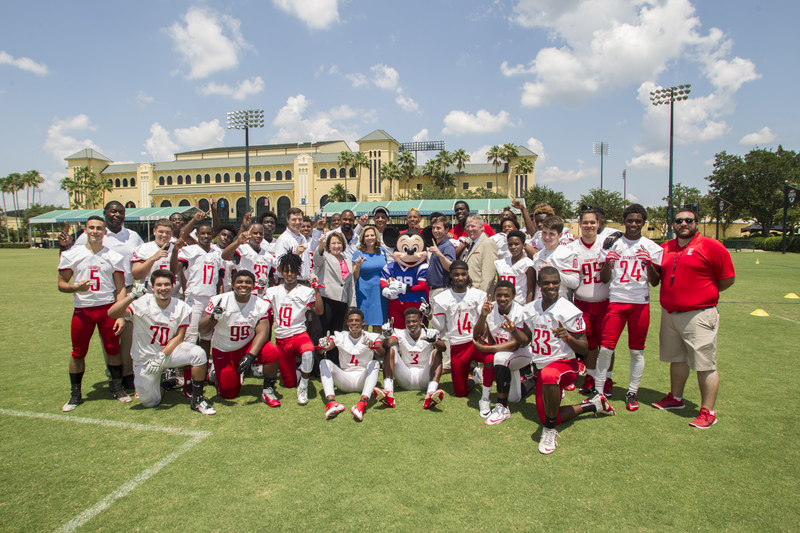 The June 1 announcement was made at the ESPN Wide World of Sports Complex at Walt Disney World Resort, site of the Pro Bowl team practices and host to unprecedented new youth-focused football activities. Additionally, Pro Bowl Week will celebrate all levels of football from youth to high school to special events hosted by the NFL’s very best professional players. Highlights of the week’s events will include the annual USA Football National Conference, the presentation of the Don Shula NFL High School Coach of the Year Award, a Pro Bowl-themed 5K run, a parade of Pro Bowl players at Walt Disney World’s Magic Kingdom Park and so much more. The 2017 Pro Bowl will feature a return to the traditional American Football Conference (AFC) vs. National Football Conference (NFC) game format following three years using a revised, unconferenced format. The NFL’s best will once again be in the spotlight as 88 players – 44 from the AFC and 44 from the NFC – are determined by the consensus votes of fans, players, and coaches. It was also announced during the press conference that the Miami Dolphins and Atlanta Falcons will play a neutral-site NFL preseason game at Camping World Stadium on Thursday, August 25. The game, which will be televised nationally on NBC at 8 p.m., will be the first preseason NFL contest in Orlando since 1996. The NFL has a two-year deal with an option for a third year to play the Pro Bowl at the Camping World Stadium. According to media reports, the Pro Bowl generated over $25 million in visitor spending in 2012 at its previous host city. Florida has not hosted a Pro Bowl since the 2009 season, when the game was played at Sun Life Stadium in Miami Gardens. Since 1979, nearly every season on the Pro Bowl had been hosted in Honolulu. This year, the NFL chose Orlando as the host city over Honolulu, Houston and Sydney, Australia.